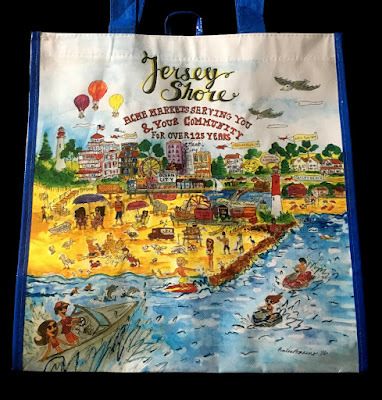 Acme's Jersey Shore Reusable Bag! Acme recently began selling a new reusable bag which celebrates the chain's history along the Jersey Shore. The illustration by Katie Herkins (sp?) includes landmarks and various town names where Acmes are located. Personally, I would have loved to see a representation of an Acme store included in the mix. Regardless, the bag is really fun and it's great seeing something designed exclusively for Acme! A note about posting: Acme Style has not officially closed for summer break although I haven't been able to get any posts done in the last few weeks. There will be a blast of posts coming soon followed by an official break. I will add an announcement to this post to give you a firm date for the start of the blast. Fire at the Bensalem Acme! Fire broke out at the Bensalem Acme on Saturday morning. The store was evacuated with no injuries reported. The fire was contained to the roof along the front section of the store. The news is coming a little late to the blog since I had little to no internet access this past weekend. Thanks to everyone for sending in the news! This location has not been covered on the blog but you can see some photos on google by clicking here.